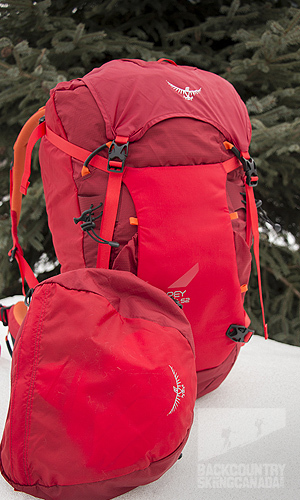 Osprey’s 2014 Variant 52L Backpack is designed for alpine climbing and expedition mountaineering. 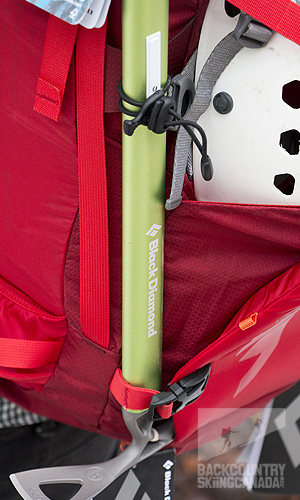 It’s successful in being extremely lightweight, adjustable and equipped to carry the tools you’ll need for your next adventure. It is a top load, unisex pack that fits comfortably with the help of the EVA foam expedition hip belt which is easily removable/adjustable to ensure a perfect fit. 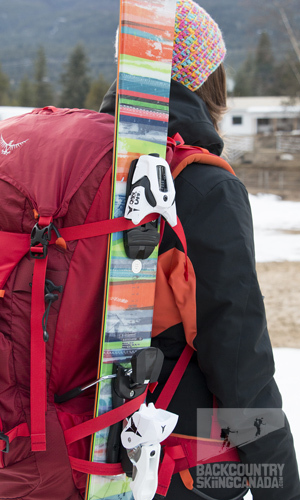 Various other features such as the A frame ski carry loops, wand/ice pro pockets, removable suspension/back panel and hydration sleeve would prove to make this pack an ideal choice for the average climber. Featured on all Variant Series packs is the removable suspension/back panel, made from HDPE frame sheet and aluminum peripheral rod. I have a special appreciation for features like this, because it can be removed in an emergency and used to brace injured limbs while waiting for evacuation up in the mountains. Another valuable feature done well is the removable top pocket. When looking to lessen the weight of your pack, simply remove it and pull the integrated FlapJacket™ closure system over to protect the main compartment from the elements. Here’s one of the dual ice tool holster, which has bungee ties at the top for easy access and a protective sleeve for the pick blades below. Buckles are sturdy and of good quality. 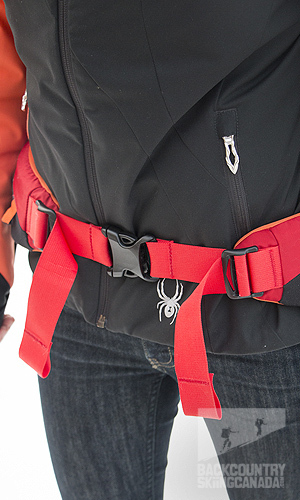 ErgoPull™ hipbelt closure is smooth and easy to use. Because of it’s narrow build, this pack allows the user an amazing amount of mobility and comfort, which is a great advantage no matter what the exercise. I really appreciated this in the pack, in addition to the amount of detail Osprey put in to the little designs found all about. 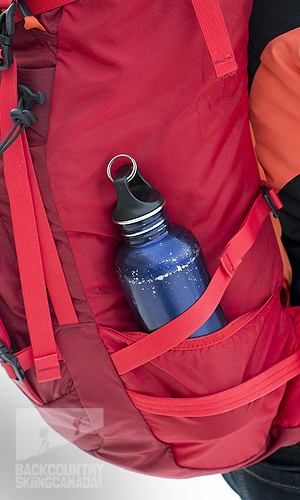 The side pockets found on either side of the main compartment are quite narrow and shallow, allowing for a small water bottle to just barely fit. 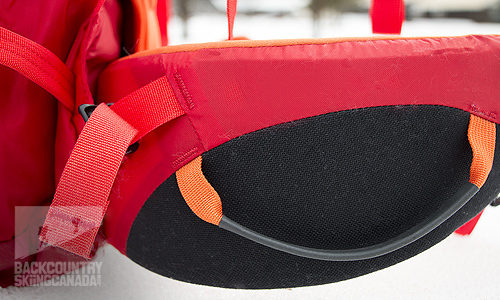 The front panel compression pocket aims to hold a helmet or crampons, but only has a hard protective layer going half way up the inside edge, making it very easy for crampons to puncture through. In addition, the pocket is a bit small to hold a helmet or any other items safely. In the photo below, the front panel is pulled down so you can see how the hard layer doesn’t even come halfway up. Reinforced gear loops are placed on either side of the hip belt, rather than hip pockets. Given this is a climbing specific pack it makes sense however the integration of both gear loops and hip belt pockets would be ideal. The A Frame Ski Carry loops hard at work. A feature that seems to hold up well. This pack is designed with alpine climbing/expedition mountaineering in mind, so being as light and simple as possible is the goal. Being not a huge climber myself, a few of the perks were lost to me. 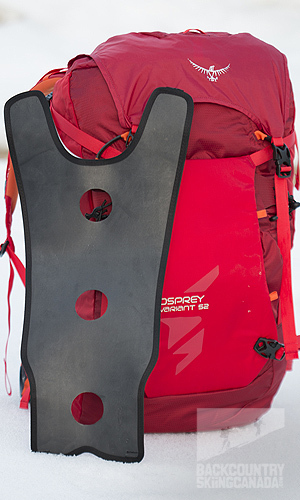 All of the features like the A Frame ski carry loops, removable top pouch and the hip belt loops are well designed for climbing and should last lifetime of the pack. 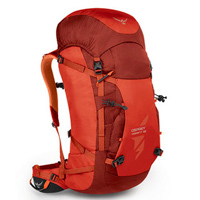 Although this pack is well made, beautiful and overall well designed for climbing and mountaineering, I feel more features suited for carrying other items are in order, such as larger side compartments, a deeper front pocket and honestly, just more pockets in general. Because who doesn’t love pockets! 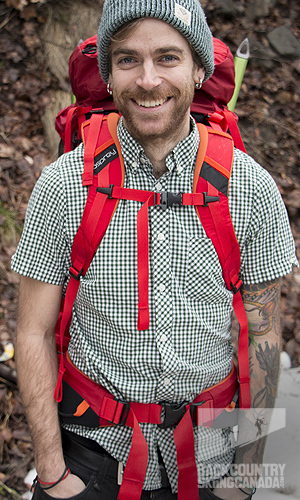 - Removable top pocket makes shedding unnecessary weight easy when mountaineering. - High level of comfort and mobility. - Diablo Red colour scheme is bright and sharp, making for a very beautiful pack and easy to spot pack. 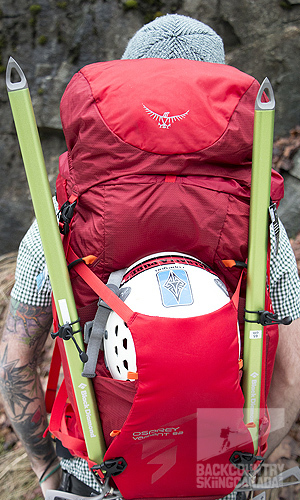 - Suitable for climbing specific journeys only and not really versatile for other adventures. - Front pocket is too small for helmet and not durable enough for crampons. - Side pockets on main compartment are too narrow and shallow to be used for anything other than wand/ice protection.